Ocean view, across from the beach club pools and restaurant.Amenity cards for The Seabrook Island Club included. NEWLY RENOVATED BUILDING! 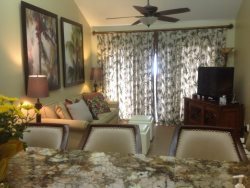 This beautifully decorated 2 bedroom, 2 bathroom villa has all the comforts of home. The living room and both bedrooms have new flat screen TV's. The ocean view off the 450 sq. ft. deck is amazing. The Seabrook Island Beach Club pools and restaurant are right across the street. Walk to the Seabrook Island Club's two 18 hole courses. Crooked Oaks designed by Robert Trent Jones and Ocean Winds designed by Willard Byrd. Either bring your clubs or rent them from the Club. Like tennis? We have the best clay courts around. The Alan Fleming tournament is played here every year. We have our own equestrian center and horses, so take a lesson or a ride. There's also fishing, crabbing, kayaking, bicycling or just take a 6.3 mile walk around the island. Or... do nothing! Just sit on our comfy deck and watch the ocean with that good book you've been meaning to read for the last year. Come relax and unwind. Bicycles:Available for rental at reasonable prices.